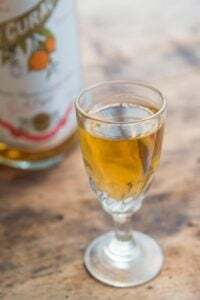 « What is a Bergamot? I know I’m just starting here, but before you and I go any further, I just have to say one thing about these brownies: They’re pretty insane. I made these brownies about fifteen years ago and found it patiently waiting in the back of my recipe files. And giving it a read-through, it all came flooding back to me and I was struck with the urge to make them again. One of the things I remember most about these brownies is how massive they were and how heavy the pan was. The pan is so heavy that I can’t imagine most people would be able to heft it with one hand. In fact, I was going to weight the pan just to prove it to you but my baking scale didn’t go that high. Yowza. I’ve come to the conclusion that chocolate brownies almost always taste better after they’ve been frozen. I’ve known this for a while now, but am finally admitting it after pulling a few of these Maida Heatter’s Barrons Brownies out of my freezer. It doesn’t matter if you eat them nearly ice-cold, or let them come to room temperature; there’s something about freezing brownies that makes them fudgier, denser, and just seems to take them to another level. Most brownies you can bite into right from the icebox, but these are so dense, and so rich, you’ll probably need to let them sit out just a bit if they’re frozen. Although most brownies I have no trouble sinking my teeth into right from the ice box. Since it’s hard to find thin mints in Europe (you can use After Eights), I made my own, using the recipe in The Perfect Scoop, which I tripled. Making them myself meant that I could make them in a big slab and break them apart to fit into the pan. (It also meant I could coat them with a thicker layer of chocolate than the ones you buy.) But if you use the round ones, fit them into the pan, then break a few apart to fill in the blanks. Maida Heatter was famous for carrying precisely-wrapped brownies in her purse and handing them out. In fact, Alec Lobrano who worked as an editorial assistant at the publishing house in New York that produced her books, said she always came into the office, telling them, “It’s a disgrace how little they pay you kids when you’re living in such a big expensive city.” Then she proceeded to reach into her handbag and dole out individually wrapped chocolate brownies to the young staff members. I can’t really do anything about the pay or the housing prices in Paris, but I could probably carry brownies around with me. Except I’m not sure I want to lug a freezer around town. So I’ll keep them here, in my home freezer instead. Adapted from Maida Heatter’s Brand-New Book of Great Cookies by Maida HeatterDo be careful not to overbake these brownies. It’s normal for the edges to get quite dark, nearly burnt but the inside should be very moist in the middle and if you insert a toothpick into the center, it should come out with soft, almost-liquid batter still attached. (It should not come out clean.) If it’s getting too dark on top, you can drape a sheet of foil over the top to finish baking.The best way to cut these brownies into neat rectangles is to use a long sharp bread knife or a chef’s knife. Maida says some people consider the burnt edges the best parts. Nevertheless, you are welcome to trim those off and do what you wish with them. 2. Line a 9 x 13-inch baking pan with foil, shiny side down. Smooth the foil then butter it lightly or coat it with nonstick spray. 5. 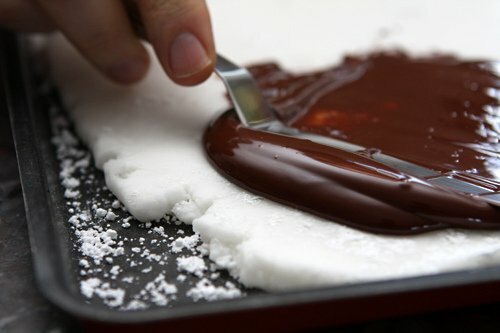 By hand, stir in the chocolate mixture, then the flour followed by the nuts, if using. 6. Smooth half of the batter into the pan. 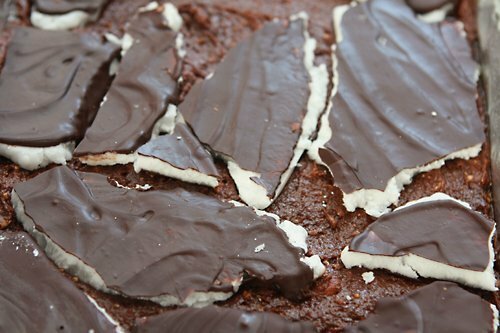 Place a layer of thin mints over the chocolate, breaking the mints into pieces to fill in any large gaps. 9. 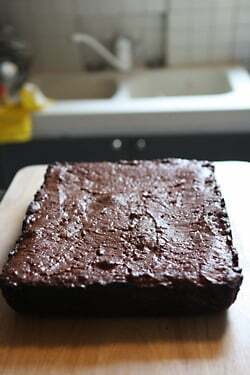 Let the brownies cool completely, then lift them out of the pan and slice into rectangles. Notes: Unsweetened chocolate is readily available in the United States but not so common elsewhere. It’s sometimes called “baking chocolate.” If unsure, check the ingredient list: it should list no sugar and be 100% cocoa solids or chocolate liquor. In France, it’s called 100% cacao and I buy it at G. Detou. Some chocolate shops sell smaller tablets, too. I haven’t tried these using all bittersweet or semisweet chocolate so can’t advise if they will work with those, but you’ll likely need to make adjustments with the butter and sugar. A few commenters inquired as to what are chocolate-covered thin mints. You can see what they look like at CandyBlog. To locate unsweetened chocolate in your area: How to Find Ingredients Mentioned on the Site. For information about substituting ingredients: Baking Ingredients and Substitutions. and yes, frozen brownies are the best and take the dessert to a whole new level, especially if they’re minty i bet! can’t wait to try these! Oh yes! Please share the home made mints recipe :) ‘After Eight’ is easily haunted in Poland, but still, would love to make my own :) many thanks! A pan full of brownies that’s too heavy to lift with one hand? Please post the recipe for the mints – I’d love to make them. I’ve got the cookbook but never made these brownies before but now I’m inspired. Am glad you are enjoying the brownies. As for the request to post the recipe for the mints, I don’t post recipes from my books on the site for a variety of reasons but I appreciate people being interested in the mints – although the brownies are the star. These brownies look divine! I just started reading your blog- quite late to the game, but I’m already addicted. How amazing it must be to live in a place with butter fit to eat alone and enough chocolate shops to frequent a different one every day! I’m currently living in Kenya, and it isn’t known for either of those staples. Kenyan butter (the good quality) makes my baked goods taste vaguely of cheese… but all of these recipes are going in the “when I’m back in America” file! Other people go through old photographs or pressed flowers. I can see you with a cold cart at the marche Richard Lenoir on a Sunday cleaning up, especially in the summer. Would ice cream cones be a possiblity too? Just had my coffee – on my way to work and would die for one of those!!! Chocolate and mint; does not get any better in my world. Thank you David once again. Good grief. I can almost smell these. I have to make them soon or I’ll implode. One, I love that this calls for 2 lbs of thin mints. That’s just about every girl’s dream right there. But sandwiched inside of a brownie? I think you just won my foodie heart! Maida Heatter is such a wonderful source for baking and living. She once wrote how, as a little girl, her mother never sent them out of the house without a bran muffin or two in their pockets. People should look for her books and just start baking. This week I will be making her hamentaschen. Yum! How interesting that brownies get even better when frozen first. Home-made After Eights? A brownie pan too heavy to lift? Sounds almost too perfect to be true. I am so excited to try these, chocolate and mint are probably my all time favourite combo (although chocolate and caramel and chocolate and peanut butter are up there too) But these look incredible! I think I’m going to start carrying brownies around for people, can you imagine what you could get accomplished in life if you handed out delicious brownies all the time? 2 pounds of thin mints! I can’t wait to try these if only for the experience of unwrapping all of those. Looks delicious! As a true brownie lover I now feel compelled to leave the office, run home, bake a tray of brownies and freeze them immediately. 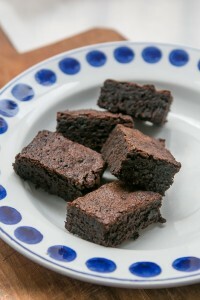 I recognize Maida Heatter’s Palm Beach brownie recipe which I have made so many times. The best brownie recipe I’ve ever found and even without the mint middles getting the pan out of the oven is a 2-handed job unless you’ve been working out like a maniac recently. Don’t fret if you can’t lay your hands on David’s book for the mint filling; the brownie part alone will put a big smile on your face. 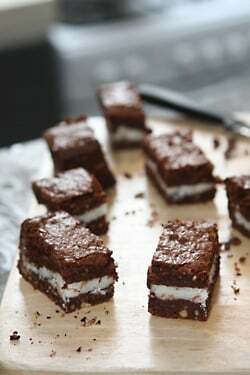 Bake a tray of brownies as usual but while still hot, cover with a layer of After Eight mints. Allow them to melt. Leave to cool to room temperature. Absolutely yummy! Has the benefit of being so easy, even kids can do it for special parent treats. I’m a long-time fan of freezing/eating frozen brownies. In my baking days, when I had a large freezer, there were always brownies in it. Or they were supposed to be there. Children found them, rather like mini metal detectors finding coins, and somehow brownies always disappeared. I resorted to sealing frozen brownies in empty frozen vegetable bags. yes, the magic freezer! I had to (ahem) buy a carton of Girl Scout chocolate mint cookies from my secretary’s daughter, who delivered to the office. By day’s end, sad to say, I’d gobbled 2 boxes all by myself. (blush) Brought the rest home and put them in the freezer, thinking this would be a deterrent.They’re even better frozen. These look amazing. I am a huge fan of eating frozen baked goods, especially brownies and shortbread cookies. Wow, these look amazing! They kind of remind me of the cupcakes my co-worker made for Christmas – which was basically a molten chocolate cake with a Girl Scout thin mint cookie on the bottom. Reheat in the microwave for 15 seconds and dig in! Am going to get your books but meanwhile, thank God I’m a lover of Andes. Oh and on the hair bleaching bit, I say go for it David. Am sure by now you would’ve figured out that word in French. My favorite part of the brownie is the edge. I love the slighty firm, chewy/crisp mix where the chocolate takes on a deeper, almost bitter, note. I always pose a self sacrificing face and offer to save my family from my poor attemp at baking brownies (wink, wink) by eating all the edges. Ah, the things we do for friends and family! There was a mint brownie recipe that made it’s way into all the little church cookbooks years ago. It had a top layer of green mint filling flavored by creme de menthe. I never made them because the base of the filling in most recipes was cream cheese. That tangy cheese mint combo is loved by many but just didn’t appeal to me. Still doesn’t. So, I keep Mint Oreos in the freezer. They are wonderful frozen. Are they like 5 kg? I think I could lift them and show off my gym progress! But I would much rather make the thin mints and eat them frozen. Sigh. Am now on a mission to discover more about Maida Heatter – especially since she has such a civilized take on the use of baked goods. I’m glad you didn’t give the weight – sometimes ignorance is blissful. As are the brownies. I’ll eat all the slightly burned edges and give away the center. Maybe. We’ll see. Well, am I lucky, since I own your book to bake the thin mints. My daughter has been watching over her Girl Scout thin mints with eagle eyes. No way, she would be sharing. Thanks for the tip to freeze the brownies. I just don’t know if we ever had any leftovers to freeze? Usually they just disappear magically. I am now wondering how much a kilo of After Eights would cost…The Palm Beach brownie recipe is one of my favorites, though I have yet to make a Maida Heatter brownie recipe I didn’t like! Which Thin Mints do you mean that are available in the US? Are these the once a year thin mints or the candies covered in green foil? Oh… we have to stop meeting like this. Wow. My blog is now officially fat with my weekly attempts at your recipes. Last week Lemon Bars, now these? My 8×8 is getting no rest! I’ve got two bags of Andes creme de menthe baking chips that have been calling out to me to make brownies with. I think this is a sign that I must do it now! I will have to halve the recipe though…Thanks David for another “timely” post. Wow! That’s one hefty batch of brownies!! I’ve been so disappointed in the quality (lack of) that I can find as far as chocolate in Italy that I’ve just been baking other things… sort of sad. 1) What kind of flour do you use? 1-2/3 cups = 170 g, that would make 102 g/cup, I hope my math is good. Cookbooks tell us 1 cup flour = anywhere between 120 and 140 grams. Is it a matter of “scoop and level’ vs. ‘spoon and level’? Naturally, if it’s 102 g, then it’s carved in stone for me. 2) Is flour added during step 5? When do you add in the flour? I’d like to make these as they are different from our usual mint brownies, which have a layer of mint frosting covered with a dark chocolate layers. The freezer trick is dangerous!! Oh, read it over again more closely. Was distracted by the nuts. Nevermind! Becky Land: Usually they just go by the name chocolate-covered thin mints, and they’re sold in supermarkets and stores like Walgreen’s. They’re similar to York Peppermint patties. Linda: I use 1 cup=140 grams of flour but since the flour gets sifted for this recipe, it’s aerated and quite a bit lighter. I sifted right into the measuring cup the swept the excess away with a knife. And yes, it’s added in step #5, after the chocolate. sandra: …it’s fun to put those mints on a warm cake then frost it with them, too! Naomi: She is still around although is not longer writing cookbooks, I believe. She really is fantastic and her books are all classics. I can’t say enough good things about here. But interesting she uses York peppermint patties. They’re fine but when I go to the US, I see long packages of peppermint patties in stores for 99 cents, so I would recommend those personally. How ironic that I jumped over to this post with a diet product ad on the right gutter. Waiter, one frozen brownie with a Slim Fast chaser, please! Your brownies look amazingly scrumptious. I also LOVE brownies out of the freezer! It is kind of dangerous since sometimes I put them there to stop myself from eating them. These look really delicious. I made your lemon bars a few weeks ago and stashed them, individually-wrapped, in the freezer in hopes of keeping them around a bit longer. No such luck (surprise, surprise)! And they were fantastic frozen too! YUM, YUM, and YUM….cannot wait to try this recipe. I made your mint chocolate chip ice cream last year, and it was delicious!!! Thank you !!!! Definitely agree that freezing does something wonderful to the texture of brownies. 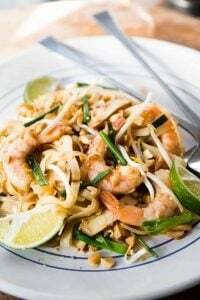 Good grief–I haven’t eat yet today, so this recipe is killing me! Well, there go my plans for being productive today. Trouble. Serious trouble. David, if you get a chance please point us toward which of your books has the thin mints recipe. I don’t think I have it in my collection, and now it feels absolutely essential! The photos look more like “York Peppermint Patties” than like Thin Mints (ala the Girl Scouts). Is the texture of the thin mint like a crispy cookie or a gooey peppermint candy? Those look insane. I’ve found that freezing anything with chocolate and mint is the way to go. Girl Scout thin mints, anyone? And I too have fallen prey to the “if it’s in the freezer I won’t eat so many” fallacy. HAH!! I love chocolate and mint! These will have to be a must try! I really like the idea of baking things in the middle of the brownie mix. I wonder if peanut butter cups would work as a centre layer in this recipe? Oh, crap. I just went to the store this morning and did not buy any mints. Guess I’ll have to get out The Perfect Scoop and make my own – which will probably be better anyway. These look incredible. Seriously, if these brownies are anywhere nearly as good as your dulce de leche brownies then I’ll probably will just die and go right on to heaven. Love receiving these e-mails. If I ever make it to Paris, I’ll treat you to coffee. These look seriously amazing. And I’m particularly excited about that homemade thin mint recipe because as a peppermint patty/junior mint/thin mint devotee…a sheet tray of them sounds AMAZING. What a beautiful brownie, David! The Girl Scout thin mints that some posters have mentioned are cookies, though, not a chocolate coated mint candy. The candy is what is needed for your brownie recipe. Another use for those theoretically “leftover” brownies, of any kind, is to chop them into small cubes and fold into a traditional cheesecake recipe. The cheesecake is beautiful when sliced and freezes perfectly, and provides two sins-cheesecake and brownies-at once. A touch of green food coloring and we’re set for St Pat’s day, I use my open sided cheese knife for cutting anything sticky -cakes, brownies, bar cookies. First, please take a look at the links in the post. Both links at the end of the article direct you to the same site: Baking Ingredients and Substitutions. I do not know if anyone commented on resources, but Callebaut makes great unsweetened chocolate, but only in the large block format (5kg), which is way too much for home baking use. However, there are stores that cutting them into manageable pieces for home bakers; in my area that would be Wholefood Stores. Please do not buy Bakers’ unsweetened chocolate; it does not even tastes as chocolate. Lastly, interestingly enough, we are starting a new blog site where the aim is to correct mishaps and errors in baking, or improving a recipe that may not work for everyone. So happen, that our first reader baked a brownie, where she changed the original recipe by trying to add marshmallow to it. Anyway, to make the long story shorter, a cakey brownie does not taste better frozen, or cold (that is what the baker baked). So, while the brownie cake appeared to be quite unappealing, to say the least, it tasted best the day it was baked. Once I put it in the refrigerator, it not only changed the taste, but the texture, as well and not for the better. 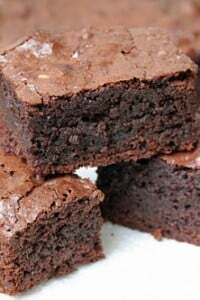 In conclusion, the fudgy brownies are too heavy, at times it feels like mud smeared all over in your mouth, if you eat it immediately, but it taste great cold, or at least after it was refrigerated overnight. Secret to cutting brownies . 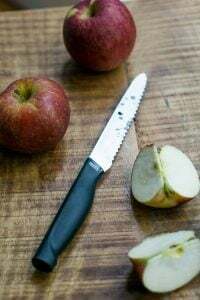 . . . . use a plastic knife. I don’t know why this works but it does! I am probably the ‘odd man out’ here since I’m not a huge fan of chocolate, brownies, or mint and I’m kind of a hopeless baker. 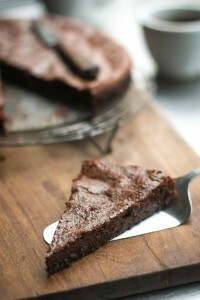 But all that aside, I REALLY want to make these AND the dulche de leche brownies that were mentioned in the comments. 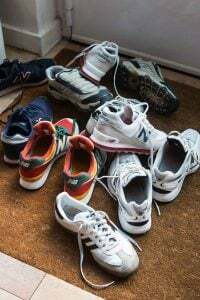 If I’m able to pull these off my husband will be in heaven. Thanks for posting. I’ve had mint brownies that seem as though they were made from your recipe. They were absolutely the best brownies I have ever eaten – and believe me, that’s high praise. I agree on the freezer trick – I discovered it by accident after a party when brownies were left over. We put a bag in the freezer and though typically baked goods don’t taste after being frozen, those brownies did improve. I’ve tried to repeat the frozen brownie trick, but someone in my house keeps eating the brownies as soon as they hit the freezer. I’m thinking of making these brownies and freezing them in wrapping labelled as chopped meat. We discovered the advantage of freezing brownies when making a wonderful Belgian Brownie recipe from the LA Times. We made too many and wanted to preserve the brownies for another occasion. You are right – freezing only improves brownies. I absolutely love brownies, well anything chocolate really, but I don’t know about the instant coffee in the recipe. I don’t drink coffee, and frankly, I don’t like it. Is there any way I can not add it? Will it mess us the recipe? I don’t really want to have to buy a whole bunch of coffee when I only need one tablespoon. You can leave it out if you wish. It’s just for flavor. The very best thing about freezing anything with chocolate in??? – the freezing process cuts the calorie content in half ! And if you believe that, you’ll believe anything :-) – the brownies sound luscious! Thanks for the update. You know, there are some people I hear about, even though I probably will never meet, add to my life, whether just a bit more joy, or actually affecting my behavior. Maida Heatter and you have each contributed to mine, both ways. Happy Mardi Gras! Haha. Thin mints in heavy chocolate brownies. Both not good for waistline. yes, Girl Scout Thin Mints are cookies, and are just one example of how life is better with chocolate, chocolate is better with mint (more often than not), and chocolate+mint = better frozen. Enjoy. This is for Inez from Barcelona: My grandparents were Catalans and I visit often. Love your city. Ooooh! brownies. One of my favorite desserts. Thank you for such a fabulous web. My time to bake is now very limited, but I close my eyes and pretend that I’m eating what you cook. I have a fantastic imagination. Thank you for making me sooo happy! Which do you recommend….these brownies, or your altoid brownies? I can’t decide which to bake this weekend. I made these tonight with 2 lbs of small York peppermint patties. They came out great! The house smells so minty. Waiting for them to cool to try them was agony! And you MUST wait for them to cool or the peppermint patties will ooze out. I will freeze some later. Thanks for adjusting the recipe to tell us what to do with the sugar and flour. The earlier posted version was confusing. Okay, there should have been a disclaimer that these are seriously addictive! I can’t imagine what would happen if I froze some… but no worries, there won’t be any left to freeze. Thank you, David, for a new staple in my repertoire. These look divine. I’m totally intrigued by how heavy they are. Now I have to make them to see for myself! Have you come across Audrey Hepburn’s brownie recipe? It’s plain & simple but hard to beat. When I was growing up, my mom would keep a tupperware container full of cookies in the freezer for unexpected company – an hour or so on the counter (time for a good visit) and they would be ready for serving with coffee. My favorite after-school treat was sneaking 2-3 of those cookies. Of course, when company came, she would open the box to find most of the cookies gone. After all those years of crunching rock-hard cookies, now I won’t even eat a cookie that isn’t frozen – unless it’s less than about 30 minutes from the oven. Looks like I’ll be making brownies this weekend. If they’re 1/2 as good as the Baked Altoid brownies, it’ll be a success. I saw this post early in the morning yesterday, and I’m still thinking about them! In the US, btw, I think the most common unsweetened chocolate brand is Baker’s unsweetened. And thank you for your expose of the most bogus diet tip of all time–freeze the chocolate to prevent yourself from eating it, indeed! Hmph! Freeze the chocolate into a new form of deliciousness, they should say! Ah David, you are the master – you take an ordinary thing and work your magic and look what happens! Now for my trick, paring this down for two people. Many thanks – again. I love ready all the comments, you do get us all going. I’ve seen advertised these special brownie pans that are specifically made so that every brownie is an “outside” piece with a crust on it (I’ve seen similar pans made for lasagna as well). I’m wondering if anyone has ever tried one and if they’re any good? I’m not particularly partial to inside or outside myself…never met a brownie I didn’t like…but I know people who are and I’m just wondering if these pans are worth the investment? Thank you in advance. WOW! These look really amazing, I must make these TODAY! I like brownies, but layering in the thin mints (one of my fav. packaged candy) would cut the chocolate perfectly. I’ve not made thin mints so I’m looking forward to doing so. I’m so glad you dusted off this recipe and shared it with us. Who doesn’t like the brownie edges? They even have all edge brownie pans. Can’t wait to make this. Plus the frozen brownie idea makes so much sense when you think about it. Well, these are just plain bad news. What are you trying to do to me and my waistline? They do look delicious! This is one recipe I will not make because I just don’t want start a really bad but delicious habit. Good grief, David. Usually I’m not a fan of brownies (I know, I know), but these. . . these look spectacular. I have to bake them. Now. Yesterday. Thanks! Hey David – these look amazing. The question I have is if you could just make the mints right on top of the brownie mixture, or if you have to complete the mint recipe – wait for it to set up and them make the brownie recipe. These sound absolutely delicious, I have a soft spot for mint and chocolate. 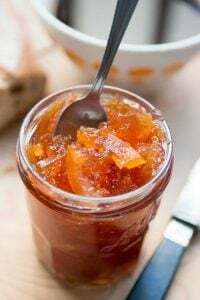 I think i will make some of these and share them with my friends at work… yum! At our local farmers’ market, one of the sellers puts aside the brownie edges. He sells them for $1 a small bag. These then go into the freezer to be eaten when I need a brownie fix. I’m out now, but I did find a bag of Girl Scouts thin mints yesterday. Yum! I wish we had a bigger freezer. I made these for Christmas this year – saw a similar brownie recipe in the Cook’s Illustrated cookie issue. But instead of using the store-bought mints, I made a batch from your book. They turned out great! I did one set of dark-chocolate mints, and a batch of white-chocolate mints, so the brownies had some variety. So tasty… And so easy! Betty: I have one of those pans (they’re called Baker’s Edge pans) and while I do like it, one does need to reconfigure recipes to fit into it as it’s not a standard 8×8 size pan. However according to their website, a 9 x 13-inch pan is a similar equivalent. One just needs to be sure to follow their guidelines for baking times. I do like mine although I don’t use it for recipes here because the cooking times vary. You can see I used it for Fruitcake bars. Sarah: The problem with making them yourself, is that it’s very very hard not to eat them all. I had to really keep my hands off them until after I was sure I had enough for the brownies. I love peppermint patties! Kiran: I made that chocolate sorbet for a dinner party last week and forgot how good – and how rich – it was. Everyone scraped their bowls clean, though.. I love Maida Heatter! She has the best stories, I love the one with the cookies and her trainer at the gym. Have you tried her Santa Fe brownies? 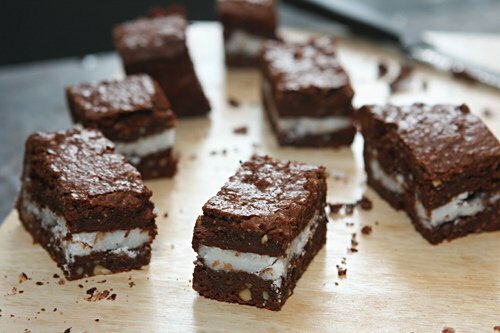 They’re nice and tall, too, (and heavy – that’s a great picture of the slab of brownie :) ) but with cream cheese instead of mint. I just made a batch and they are decadent! A warning, however, the patties tend to bubble and in my case fall on the oven floor and ignite. How nice to hear Maida H. I never hear anything about her anymore, so I am glad to see you mention her. A great baker! Perhaps you should form a relationship with G. Detou and have your own Lebovitz shop on the side. I showed up G.Detou the other day after obsessing about this perfect St. Patrick’s Day recipe, and they are sold out of 100% cacao chips and all they had was a 3kg block! I certainly do not have use for that much chocolate. Any other alternatives to G.Detou for the chocolate? I’ve tried a few supermarches and the most % cacao they carry is 85%. Looks delicious. Where do you find so many great recipes? My layer of small York Peppermint patties started sinking. I beat everything for 10 minutes with my Kitchen Aid Mixer, but did not add nuts. Hopefully all will look nice when cooled! I have a question about the baking time for the Dulce de Leche brownies (in your book “The Sweet Life in Paris”), and wasn’t sure where to post it, but thought another brownie entry would be as good as I could find…. At any rate, the baking time listed in the recipe in the book is 45 minutes. That’s longer than any brownies I’ve ever baked before, but I thought perhaps the caramel required the longer baking. At any rate, I took them out at 39 minutes. The edges were quite dry, but I cut them off, before serving them. My husband said that they were the best brownies he ever ate, and I, personally, tend to like more cakey than fudgey brownies, so was happy with them. But I’d like to try them as you intended, so would appreciate if you could confirm the baking time. Also, noticed there is no salt added to the recipe (although you mention one can use salted butter). Can you confirm that “No salt” is also correct? Thank you so much! I enjoyed your book (and blog) immensely, and plan to visit some of the places mentioned on my next trip to Paris in May. I just made them! I admit I wimped out and used only 1 pound of York Peppermint Patties. I think the ‘patties jumping out’ problem that some other posters referred to is the fact that the York patties tend to ‘spew’ some interesting white ‘spritz’ at the edges of the pan. 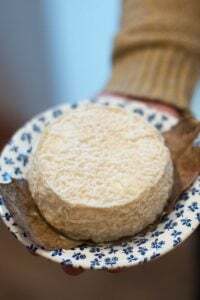 When they cool, they form a sort of glassy, hard sugary crust. I laid the pan on top of a baking sheet, so no problems with leakage in the oven. I have to say that the inside brownies are much prettier than the outside ‘crust’ edges, but the ugly edges are delicious! Oh great minds…………I’ve been hoarding thin mints from my Girl’s Scouts cookie sales with the idea of freezing them and crumbling chunks in my brownies….. Yummy, yum yum! And David, I would honestly love to send you some thin mints (I live in the Hague, Netherlands) and would be honoured to send you a box or three. Alternatively, I’ll be in Paris for a long weekend in mid April. Let me know if you’d like some! Just made these with your thin mints from The Perfect Scoop. They are spectacular with a scoop of your anise ice cream on top. Just so you don’t have to wonder anymore, they weigh about 5.5 lbs (2.5 kg). the best source for great desserts. Thank you for the mint addition. O.K. I finally made some brownies and my daughter helped. Instead of chocolate-covered thin mints, I used unsweetened shredded coconut. A Caribbean delight! 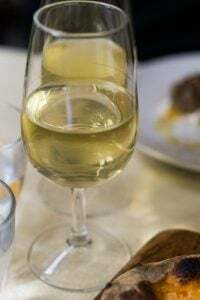 I served it with real mint tea and white wine poured over ice. No crumbs left. My family loved it. I made these last night to take to work for our St. Pat’s day party. I left out the nuts, but added green food coloring to the “peppermint” in honor of St. Pat’s. I’ll say one thing, you only need a small square to achieve sugar high! WOW, maybe because I’m working to cut the added sugar from my diet, but these hit me like sugar rocket, but sooooo good! Thanks, David! Hi Barbara: Yes, I absolutely have baked these at this temperature. Saveur magazine also printed the recipe with the same baking time and temperature. I have made these three times now since you have posted this and even mixed things up and tried different variations. I love Almond Joys, so I actually made a homemade version for the center. They came out fabulous! Most importantly, I have to say I appreciate the fact that you always give weight measurements. My first pan of brownies were great, but the subsequent two pans were better because I weighed the ingredients. fortunately the burnt taste shines through now. I have made these three times, always at 425 degrees, always for exactly 35 minutes. I can only guess that folks need to recalibrate their ovens or use an oven thermometer and adjust your heat accordingly. David can correct me, but I do not believe this would be a time to use convection either. Once you get the kinks worked out you will LOVE LOVE LOVE these! Oh Yum! Admittedly I found this recipe in Saveur and make them every so often. Fun to see you highlight them on your blog. They’re distinctive enough that I knew at first glance of the picture that this was Maida’s recipe. Well, I made the peppermints from Perfect Scoop (triple recipe) and found that it was very hard to dip. I had enough to make 2 batches of brownies. The peppermint was hard to dip in large pieces, so I’m not sure what went wrong. I did chill the insides overnight before dipping. 2nd question. I do check my oven temp with a laser thermometer, but the top of the brownies were burning after 17 minutes. I don’t have a clue what was wrong….. At least there’s enough peppermint for another batch of brownies, but I’ll wait until someone can help. Help!! eilleen: Because all ovens are different, if things cook too hot on top, you can drape a piece of foil over the top. I did not dip the pieces in chocolate, due to their size, but instead spread chocolate over the top as shown in the post. janniferc: Make sure to use 100% cocoa or unsweetened chocolate (not bittersweet chocolate) in the recipe. I was just looking over the recipe with the idea of making the brownies tomorrow as I made the peppermint today. However, the sugar weight for the brownies seems to be out. The recipe asks for 3.25 cups/350 grams. Should this be 700grams? I believe the expected weight of a cup of sugar is 200 grams. Thank you! I had fun having a go at these – when I can get hold of some proper 100% cacao I will do it again (and again).